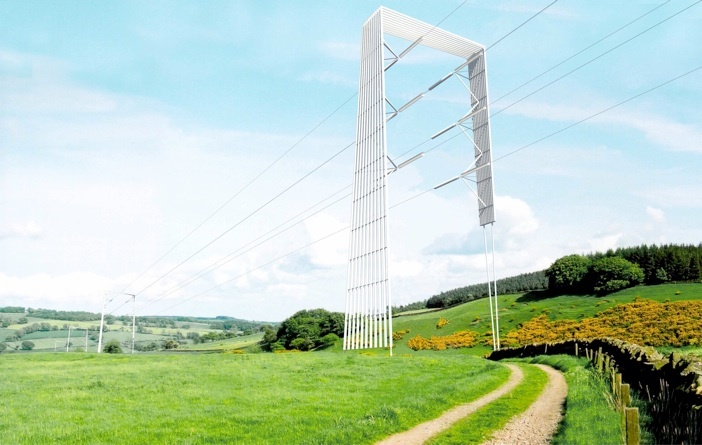 A tapering tripod structure folds over the top of the power lines, allowing more usable space on the ground. When viewed head on the vertical fins allow views through to the sky beyond. When viewed from the cable route the arching structure frames the view beyond rather than obscuring it with a central column. The fins contain the otherwise cluttered insulators. The pylon is as transparent at all times except for a short momentary spectacle at twilight when it lights up before fading back into the landscape. Each pylon measures the electric current locally throughout the day; the brightness of the illumination depends on the local power demand that day. National and local consumption is measured and displayed online to encourage local and daily reductions in demand. Competition model and views by James Kirk.